As result of the EU Council Directive 99/74/EC of 19 July 1999 laying down minimum standards for the protection of laying hens, the use of the conventional cage system is prohibited since the 1st of January 2012 in the European Union member countries. Simultaneously, in some of the member countries (for example: Denmark, Finland, Sweden and Germany) the beak trimming of the laying hens – which is momently allowed till 10 days of age in the European Union – is also prohibited, while in some other member countries (for example: United Kingdom, France and Netherlands) its prohibition is being considered. 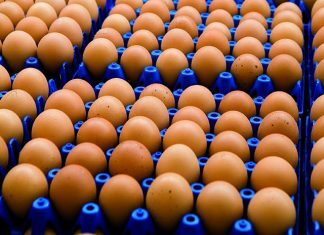 The spread of both alternative and non-cage laying hen housing systems and the more forceful European refuse of beak trimming generate new problems in the commercial egg production. The hybrid layers, which have been reared in cages for more than 70 years, have vital temperament, are susceptible for feather pecking and in more cases they are expressly aggressive. This type of social stress was not considerable in the small group (4-5 hens/cage) housing systems, because its occurrence was efficiently eliminated by the beak treatment with thermocautery, laser or infrared light. However, it seems that this decades-long selection has resulted in a higher production, but also, – in spite of the purpose of the breeders -, in even greater birds’ aggressiveness, which can generate permanent conflicts in large groups raised in alternative systems. Stopping the beak trimming in laying hens could improve the mortality in the farm in case the current genetic programs remain in use. Therefore, the present aim of Bábolna TETRA Ltd. is to develop a new hybrid, which is able for high production in alternative housing systems without beak trimming. 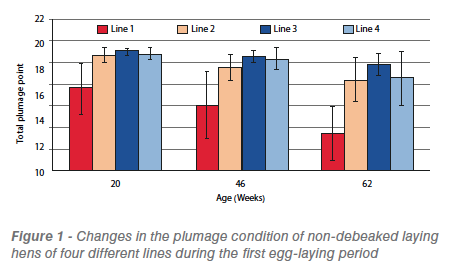 As first step of this development, non-debeaked layers from 4 lines of the TETRA breeding program were tested in order to compare the changes in their plumage and body condition during the first egg-laying period. The experiment was carried out with 1742 non-debeaked TETRA laying hens, raised in EU-compatible furnished cages (1,800 cm² basic area each; 10 hens/cage), in a closed building at the Poultry Test Station of the Kaposvár University, Faculty of Agricultural and Environmental Sciences, in Hungary. Hens were fed ad libitum with commercial diet during the whole experimental period. Drinking water was constantly available from self-drinkers. 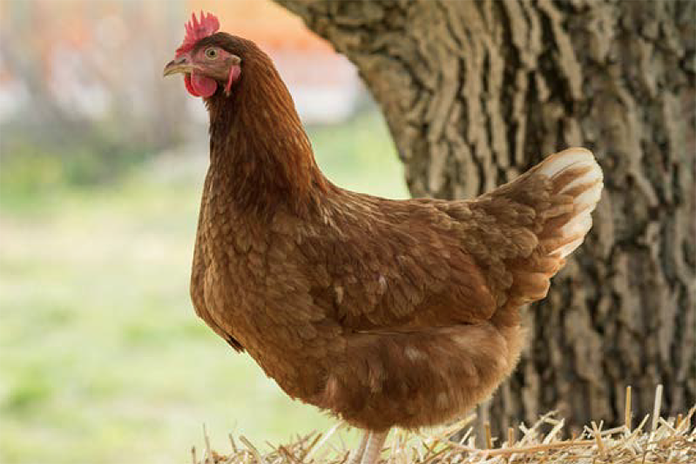 The plumage and body condition of randomly selected 120 hens (30 hens/line, assigned with wing tags individually) were examined at 20, 46 and 62 weeks of age. The plumage condition in five different body parts was checked: neck, breast, wings, back and tail, taking as a reference the Tauson’s et al. (2006) photo series. The plumage condition was evaluated for each body part on the basis of a 4-grade scale, where 4 points were given in case of complete plumage and one point was given in case of very incomplete plumage. By summarizing the plumage points for the different body parts, a total plumage point was calculated for each hen. It could be ranged from 5 to 20. The hens’ body condition (body fat content) was determined by means of computer tomography (CT) in vivo at the Institute of Diagnostic Imaging and Radiation Oncology of the Kaposvár University. Before the CT measurements the live weight of the hens was always recorded. 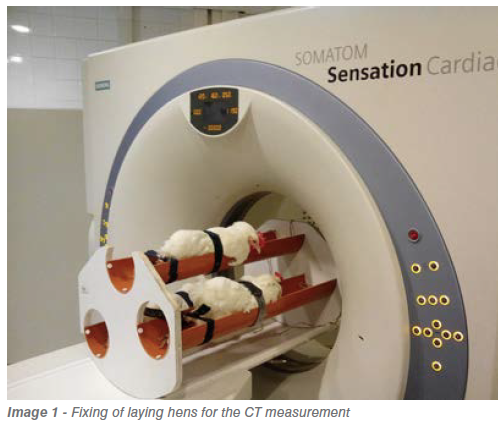 During the CT scanning procedures birds were fixed with belts in a special plexi-glass container, without using any anaesthetics. Three animals were scanned simultaneously (Image 1). 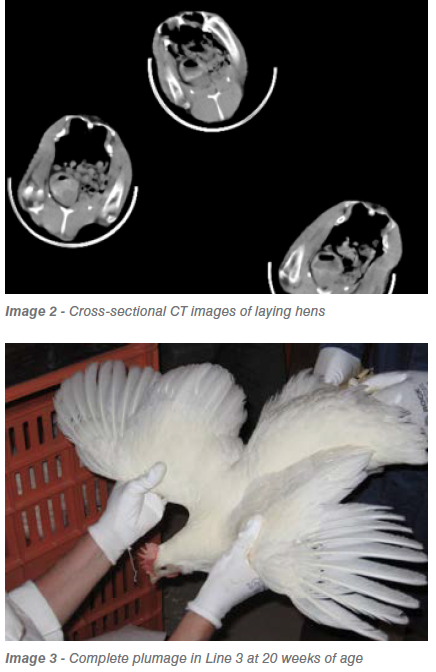 Due to the special arrangement of the hens, they were separable on the CT images (Image 2); therefore, their body fat content was individually determined. The CT measurements consisted of overlapping 10 mm thick slices covering the whole body using a Siemens Somatom Emotion 6 multislice CT scanner. From the images obtained the volume of fat was determined by using the total number of pixels with X-ray density values of fat, i.e. the range between -20 to -200 on the Hounsfield-scale. For determining the body condition of the hens, the ratio of the volume of fat to the live weight was calculated. For the statistical evaluation of the differences in the plumage and body condition of the examined lines One-Way Analysis of Variance was used. 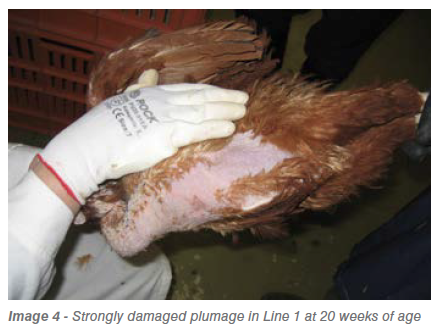 On Figure 1 it can be seen that the plumage condition of Line 1 was the worst during the whole examined period. The total plumage point was significantly lower already at the start of the egg production in this line than in the others (P<0.05). While the Lines 2-4 had almost fully complete plumage (Image 3) at 20 weeks of age (average total plumage points between 19.4 and 19.7), the plumage of the hens in Line 1 was strongly damaged (Image 4) already at this age (average total plumage point 16.7). While total plumage points under 18 were not observed in Lines 2-4, thirteen hens of Line 1 had total plumage points between 11 and 17 and none of them had 20 points at this age. Although the total plumage points declined in all examined lines during the experimental period, Lines 2-4 had relatively good plumage condition (Image 5) at the end of the experiment (average total plumage points between 17.4 and 18.6). In spite of this, the average total plumage point was only 13.0 in Line 1 at 62 weeks of age (Image 6). 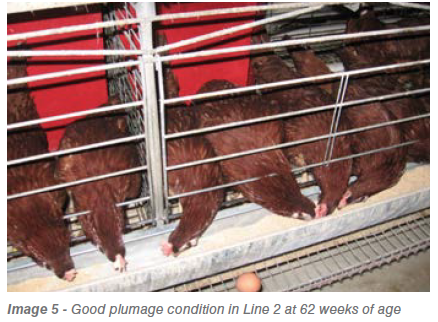 As it is visible on Figure 2, also the body condition of the hens was the worst in Line 1 during the whole experimental period. In this line the body fat content of the hens decreased by 14.5% between the start and the end of the experiment. The best body condition of the layers was observed in Line 3 at all examined ages. 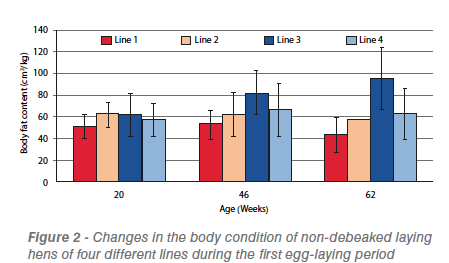 In this line the body fat content of the hens showed an intensive increase between 20 and 62 weeks of age, and it significantly differed (P<0.05) from that of the other lines at the middle and particularly at the end of the experiment. 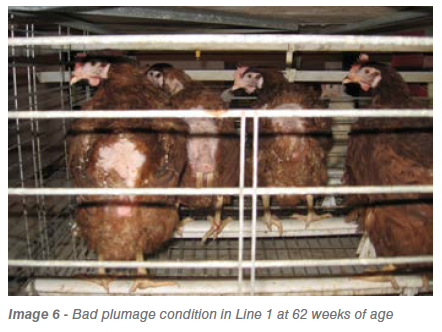 In this line the hen’s body fat content was more than double at 62 weeks of age compared to that one of the Line 1. From these results it can be seen that the worst body condition was observed in the line with the worst plumage condition, while the best body condition was recorded in the line with the best plumage condition. Therefore, it can be concluded that the occurrence of feather pecking in non-debeaked laying hens results not only in damages in the plumage condition, but also in decreasing the body fat content, i.e. in failure of the body condition. 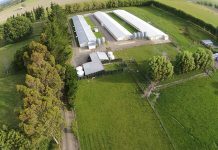 Therefore, for maintaining the high production level also in non-debeaked layer flocks, selection of the hens (lines, families, individuals) for calm temperament seems to be very important in the future. Tauson, R. – Kjaer, J. – Maria, G.A. – Cepero, R. – Holm, K-E. (2006): Welfare implications of changes in production systems for laying hens. Work package 3. Final report health, D.3.1. The creation of a common scoring system for the integument and health of laying. Specific Targeted Research Project (STR eP).